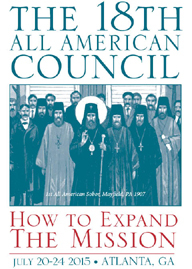 Plans are proceeding on schedule for the 18th All-American Council [AAC] of the Orthodox Church in America, which will convene in Atlanta, GA July 20-24, 2015. Other AAC plans include the following. Committees have initiated their work on revisions to the OCA Statute and financial reforms, topics that will be addressed at the AAC. Appropriate related materials and resources will be released at the end of the summer 2014 for commentary and input from the entire Church and her dioceses and parishes. Father Eric noted that “town hall gatherings will be held across the continent to present the material and garner input to be integrated well before the AAC.” Final materials will be issued 90 days before the AAC’s opening. An official AAC web site—18aac.oca.org—will be launched on July 20, 2014, one year in advance. The site will feature general information about Atlanta, all documents pertaining to the AAC, and all necessary documents. “For the first time, delegates, observers and youth will be able to register on-line,” said Father Eric. “This eases the registration and approval process and allows for quicker entry to events.” Registration will open in January 2015. The assessment level for the 18th AAC has been approved at $12.50 per person. Notice of the assessments will be sent to the parishes by the OCA Treasurer by August 1, 2014 to assist parishes in preparing their 2015 budgets. The AAC assessments will be due in early 2015. The Fellowship of Orthodox Christians in America [FOCA] will hold its annual convention in Atlanta July 18-21, 2015. This will be a “first” as it is being held in conjunction with the AAC, thereby providing additional opportunities for participants in terms of fellowship, worship, and Christian service. Other events—workshops and talks based on the theme and related activities—will be announced as the planning process continues.